Kleefeld on Comics: Somebody Make It Stop! I actually have several problems with this, and about the only way it could bother me more is if they offered a foil-stamped, holographic, die-cut cover variant. Problem 1) As much as I'm not keen on throwing the President's image in/on comics in a cheap attempt to boost sales, there's at least a modicum of useful material to work with. After all, he's been around for a few decades and has a life story which is actually pretty interesting. But the dog? He's seven months old! Granted, he's had an interesting life for a seven-month-old canine, but I can't imagine any comic story about him at this point NOT being largely fabricated and/or obnoxiously decompressed. My point is that I don't know that there's anything there beyond the dog's name. Malia and Sasha would have been much more interesting/useful/insightful/cute subjects. Problem 2) "Puppy Power." Really? You want to try to make a positive association with the most annoying cartoon character ever made for what was an otherwise decent show? They made him a villain in the Scooby-Doo movie for a reason. Whoever decided adding "Puppy Power" to the cover here needs to be shot. 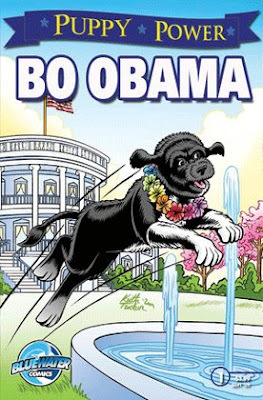 Problem 3) The name Bo Obama, when written across the front of a comic like that in all caps does seem to spell "Boobama." I can almost guarantee that at least some people will buy the book specifically for that reason. Bluewater Productions, I quit you. #2) Agreed. "Presidential Pets" would have been better. breast augmentation, booty calls, milfs, trannies. One wonders how internet filters like Netnanny will handle this. Always google names before using. "Boo boo bama" is urban slang.